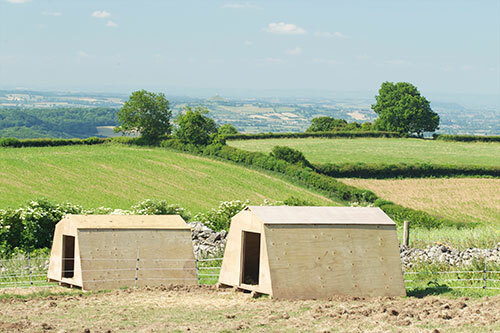 The Plum Pudding Pig Company breeds rare breed pedigree Oxford Sandy and Black pigs on the top of the Mendips in an area of outstanding natural beauty. The Oxford Sandy and Black often known as the ‘Plum Pudding Pig’ with their black blotches all over, reminiscent of the fruit in a plum pudding, were also the pig that many people used to own and keep in their garden. 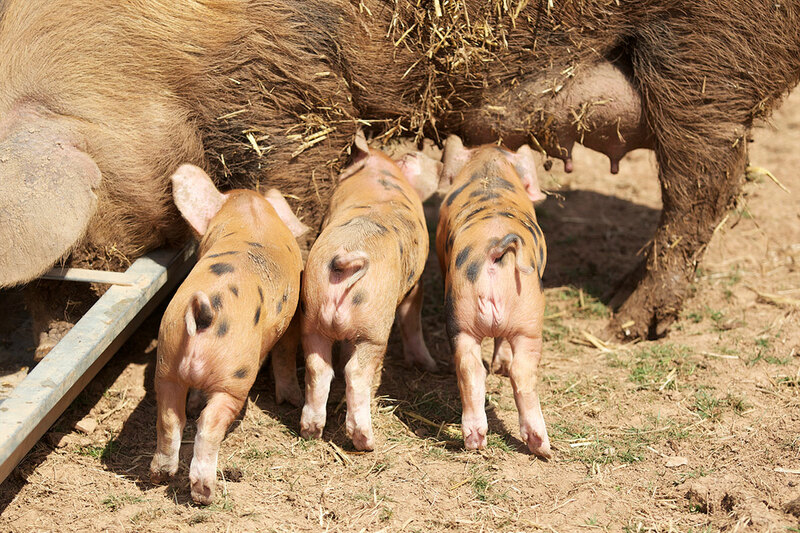 The Oxford Sandy and Black is one of the oldest British pig breeds and is on the endangered list with less than 200 breeding sows (2006 survey). 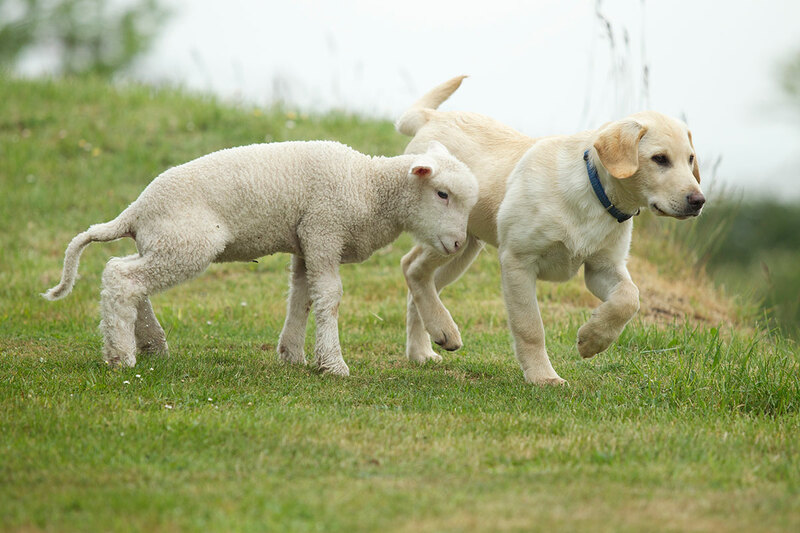 This breed was on the verge of extinction 20 years ago but is increasing in popularity and it is not hard to see why. The Oxford Sandy and Black is a medium to large pig with lop ears. The colours vary from a light sandy colour to a deep ginger with random black patches. The feet are white, they have a white blaze on the face and a white tassel on the tail. 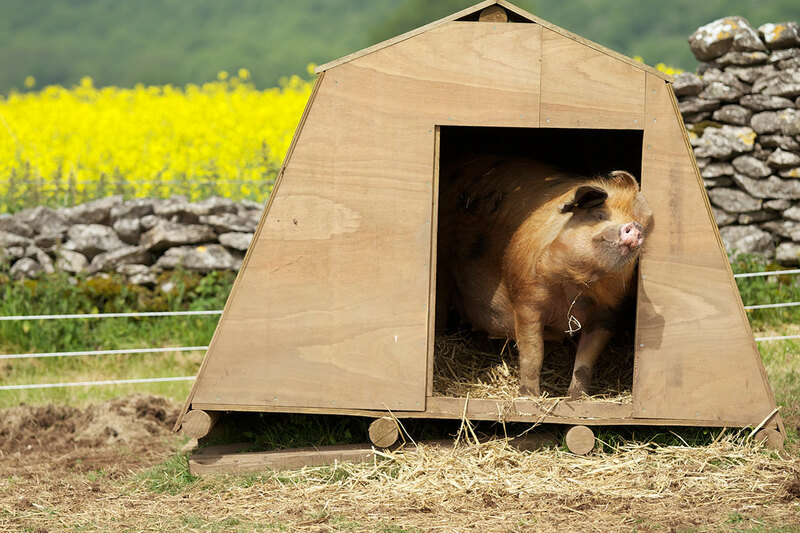 All our pigs are free range and live outdoors all their lives, doing what pigs do best – rooting around for tasty things to eat. 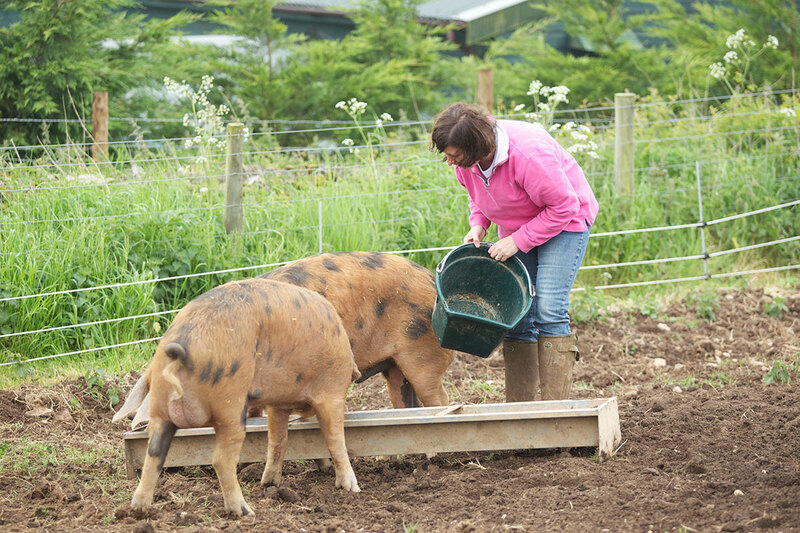 Only 4% of pigs raised in the UK are truly free range outdoor pigs. 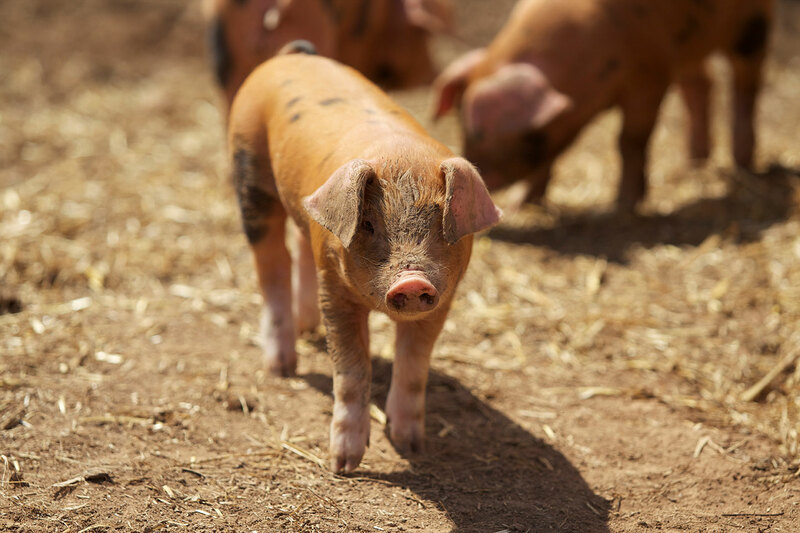 Our pigs are not fed genetically modified products or antibiotic growth promoters, they eat only pig nuts with the addition of fresh fruit and vegetables. Bananas are a particular favourite, skins and all! 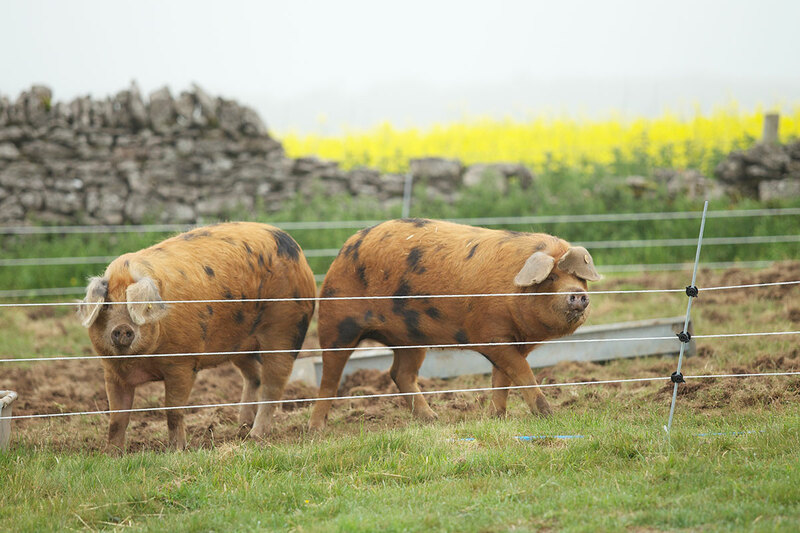 Our pork is produced from pigs kept to at least 6 months old so that the pork from Plum Pudding Pigs has been allowed to mature and has a denser flavour from muscle built up from living outside. Plum Pudding Pigs do not have nose rings; they are free to root up the ground, which they do – sometimes it looks if they are digging a tunnel to Australia! Plum Pudding Pigs do not have their tails docked. This has been done on commercial rearing to prevent tail biting, which occurs when pigs are bored or kept confined. Plum Pudding Pigs are allowed to roam at will with the freedom to behave naturally, they tend not to bite each others tails; they have more interesting things to do. Plum Pudding Pigs do not have their teeth clipped or ground – a painful and stressful procedure. 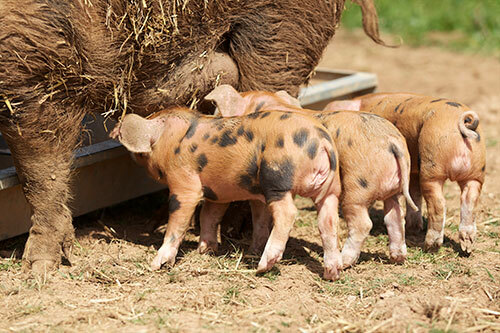 Plum Pudding Pigs do not castrate the boar piglets as boar taint of meat is not something that traditional breeds in a stress free environment suffer. Plum Pudding Pigs do allow their pigs to have freedom to express normal behaviour. 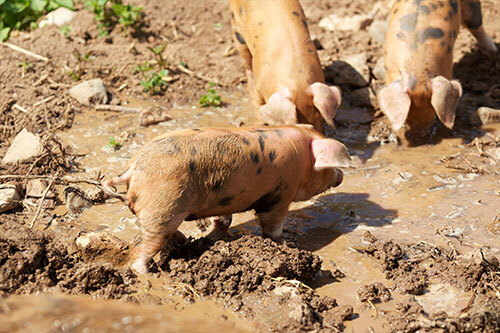 Plum Pudding Pigs have free access to water, wallows and lots of straw in their arcs. Plum Pudding Pigs have a varied diet. 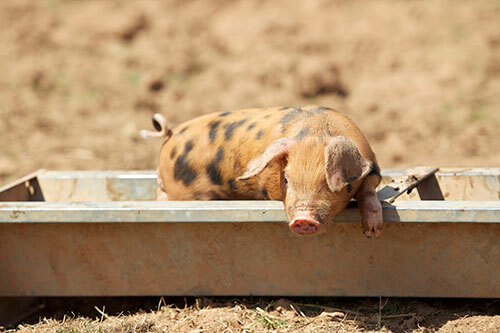 Plum Pudding Pigs also get love and attention, sunscreen on their ears if very sunny and a cool shower! We are passionate about our Red Poll cattle and have very high standards of animal welfare and farm with respect for the environment. Our beef animals have grown naturally to maturity fed on grass on the Mendips, there are only two Red Poll herds in Somerset. Sign up to our newsletter for latest information on our products. 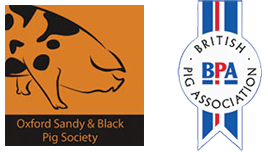 We are members of the British Pig Association and the Oxford and Sandy & Black Society.